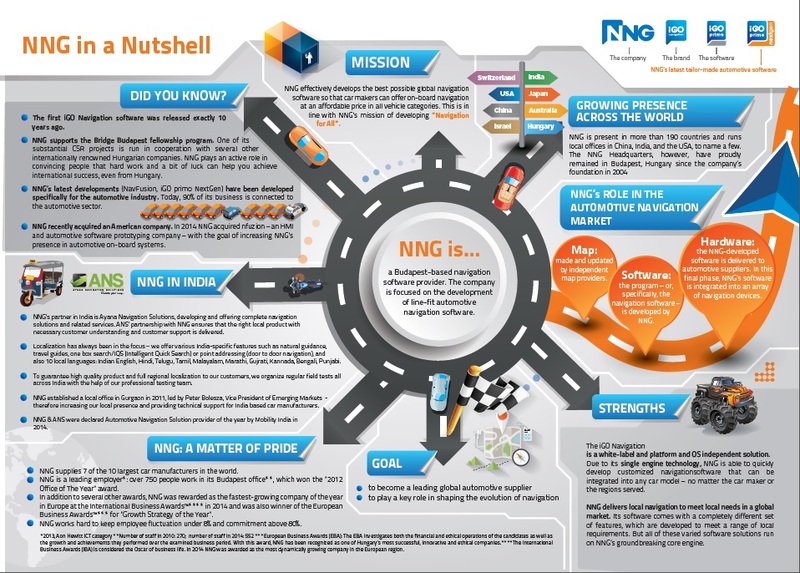 NNG, the Hungary-based leading automotive navigation provider realized a growth of 25% YoY in their India operations. They have also forecast a 40% increase in revenues for India in the current financial year ending December 2015 announced in Mumbai, 12 August 2015. This is in line with the tremendous expected growth of the automotive sector in India. NNG develops cutting edge infotainment and navigation software for the global automotive market. The company offers on-board, 3D navigation applications that incorporate connected features and a universal online update portal. NNG’s goal is to make in-car infotainment and navigation easy, fun, safe and integrated through all communication devices for everybody on board. Unique features and advanced technology, combined with a high level of flexibility, enable fast time-to-market at a low cost. The award winning iGO Navigation Software is currently installed in more than 20 million devices worldwide with over 30 million signed orders from 34 global car brands. NNG continues to strengthen its global footprint through 11 offices around the world, including Hungary, Japan (2x), the United States (3x), Switzerland, Australia, Israel, India, and China. Now Coming back to the point of growth on NNG This growth is based on the one engine technology the company applies: with the easy adaptability and flexibility of the software NNG can turn its “Navigation for All” strategy into reality – providing navigation solutions tailored for the individual needs and concepts of the OEMs. It is complete with a number of India-specific features to fully accommodate the local market, including local languages. NNG has been present in India since 2011, with their office located in Gurgaon. The company is the proud holder of the Mobility Excellence Award 2014 for “Best Automotive Navigation Provider”, awarded by Mobility India. So here is all story rounding up. Just tell us if you opinion in comment section below. Stay tuned for more. Thanks for reading.